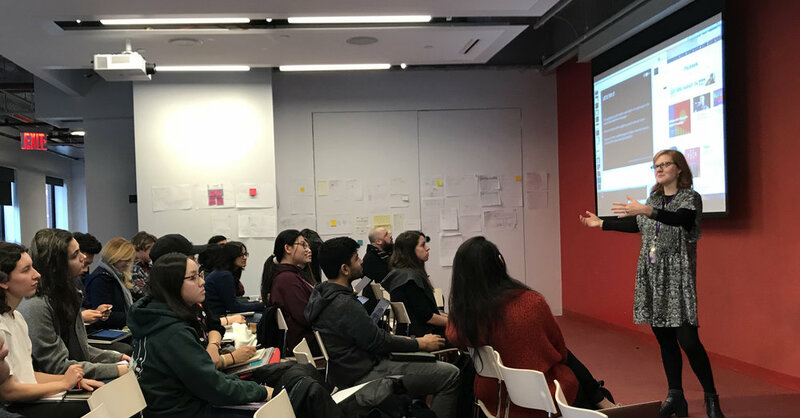 First day of the class: User Experience Design, Spring 2018, Integrated Digital Media, NYU. Professor Dana Karwas. At the beginning of each new semester or school year, teachers are faced with the challenge of remembering names for a large number of new students. Design an experience to help an educator match faces to names, with the goal of shortening the time needed to reach complete un-aided accuracy. Provide a high-fidelity mock for at least one step of this experience. Why I selected this prompt? At first this challenge seemed simple but I soon realized that this problem often gets overlooked and is not properly addressed. I have been a student for many years and also work as a graduate teaching assistant for my professor at NYU, so I immediately connected to the problem of matching the student names to their faces— and realized that it might be a problem for many educators. For me it was interesting to think about this and dig a little deeper in order to learn the underlying issues, and try to come up a better way to help address this problem. Personas: I want to first focus on University level education (Undergrad & Graduate classes), since educators at this level need to constantly learn new students every semester, which occurs more frequently than in most k-12 level classrooms. So the main challenge is to design an experience to help professors at the University level match faces to names, and shorten the time needed to reach complete un-aided accuracy. Feasibility: How to come up with something that would solve the issues but could also be used in a wide range of situations? There are many different types of classroom spaces, and the facility in each space is not always the same. Additional it is importatnt to consider that educators have their own preferences when using technology to help them in the classroom, thus creating the additional challenge of making the solution more universal. I approached this challenge by trying to understand some research articles and studies associated with not only how humans memorize things, but how humans memorize the names and faces of others in general. I learned that for some people this might not be a big issue, but for a lot of people, rememberoing names is super frustrating and a little embarrassing! Some interesting insights from my readings included; the importance of making a direct verbal connection to the new person, everyone likes to hear their name spoke out loud, and the repetition of saying words over and over is the best method for transforming short-term memories into long-term ones. At the beginning of each new semester, you have to remember names for new students, what’s your experience for that, matching faces to names? Any funny or embarrassing stories? How long does it usually take you to learn all the names? Do you use any methods or cues to help you match student names and faces? Have you ever forgotten student names? What was that like? What was your process? Have you ever misprounouced a name? What did you do now to prevent that? What’s the average class size? How many classes you teach every semester in average? "It's the one on one meeting in my office. The interaction really helps me to remember the person." "The photos of student in the roster. Also, when they just come and talk to me after the class." "Students can feel you care about them, and that can set the tone and dynamic of the class." "The assignment I asked them to turn in, writing your bio 30 years from now." "I would ask them to introduce themselves at the first class.Telling some funny or special stories." "The roster with student photos is really helpful to me. I also take a lot of notes on the roster." From the educators I interviewed, all of them thought memorizing and matching new student names to faces was challenging, but they all have their own ways and methods to deal with the problem, and they all think memorizing students, and matching their names and faces are crucial, and actually have some impacts on the quality of the students education. I noted two primary elements that helped professors match faces to names: (1) personal interactions with the students and (2) referencing the roster with the student photos. For the interaction with the students, most of the professors mentioned that one on one conversations significantly helped--- for example the individual meeting in their office, or the student coming to them after the class asking question or just a simple greeting every time they meet. Those personal interactions provide educators with something for students to associate with, and that really helps them match the student name to the face. Some professors rely on the roster with student photo headshots for matching faces and names. They will take attendance with the roster at the beginning of the semester and that helps them to learn appearances of the students and also how to pronounce all the names correctly. One professor even mentioned that there were no student photos next to the name on the roster in the past, so she would take photos of students at the very first class. However, some professors pointed out in most cases the students do not look exactly like the photos in the roster, because of the style they dress, the way they talk, etc. It is very difficult for most professors to identify the name to the face solely from the roster. After researching and interviewing, I started to map out the journey as to how an educator matches new student names and faces to reach complete un-aided accuracy. Basically, the professor will have the class registered students profile on the class roster on the school system. Most of the time the professor will print out the roster at the beginning of the semester, and in the first and second week of the class, they will learn student names and faces with the help of the roster. The professor might take some notes on the roster, for example a students nickname, or their appearance. Other than that, the personal contact with students helps the professor to match names and faces, for example one on one conversation in their office, or a talk after the class. The journey map helped me identify the key elements for this process. I learned that "associative experience" is the key for people matching names and faces. The two elements I learned included the professor using the roster to match student names and faces and personal interaction can shorten the time professor requires to reach complete unaided accuracy. So I started to think of combining these two elements together as a possible solution. Then I had this idea, which was inspired by Harry Potter moving newspaper, why not make the roster interactive? If the profile on the roster is not just a photo, instead, professors can see how students talk, hear their voice, and how they pronounce their names, that might help professors to learn and match the names to the faces in a shorter amount of time. The Big Idea: An Interactive Roster! So the idea of the experience is to design the combination of personal contact with the student photo roster, which I named, Interactive Roster. The Interactive Roster will serve as an additional feature to be integrated into the existing system. There will be no need for buying new devices, downloading new applications, or designing a completely new website. Combing the two key insights from the research. I designed the "Interactive Roster". Every new students will be asked to submit their photo for their school ID when they register for classes, which will also be used for class registration and the roster. If they did not upload the photo on their own, the school will have an ID photo taken at the ID center to be added to their academic profile. The design for the Interactive Roster solution is simple: Showing both the photo and a simple intro video of the student to assist the professor in being introduced to the student through the roster. It works like this: When the student is asked to upload their ID photo, the student will also be asked to record a short video clip no longer than 10 second for saying their name and maybe nickname they prefer to be called in class. The short clip will be shown in the student's profile page, and also integrated to the school's roster system. So when the professor opens up the class registration roster, they can see students photo and the introduction video. If the professor clicks the video clip, they could watch the 10 second brief intro from the student, and they could take some notes after that. 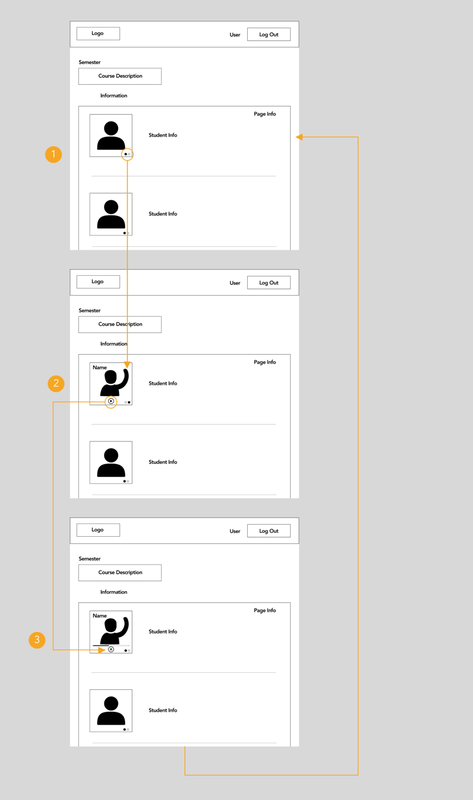 Based on the Lo-Fi wireframes, I made a clickable Lo-Fi prototype. For testing out the prototype and getting feedback on this idea, I conducted the user testing with the Low-fi prototype with professors in NYU. The participants were given the following prompt to finish the task. "It's the first week of the semester, and you want to learn new student names and match their name to their face, and you also take some notes on the roster before the first class. So you open up the school's roster system." What is the most useful part of this Interactive Roster? Do you think this can help you shorten the time matching student names to faces? What type of notes do you want to leave? What other features will make this more effective to you? Would you want to integrate this feature into the current Albert (or similar) system? Or would you want to see an entirely new interface? Why? All participants felt this feature was really useful and they stated that the feature could definitely help them shorten the time it takes to match student names to faces. Some participants in the user test would like to leave phonetic notes on how to pronounce the name or student nickname. Some participants would also prefer notes that reference a conversation or something that a student said or did. One participant highlighted that listening to the students say their names out loud in the video clip was super helpful in making the association of the name to the face and would increase their ability to quickly learn the students name. One participant suggested adding a feature that such as a check box or color coding system for names learned or to be learned. For example the names that the professor is having a hard time learning should e highlighted in the interface. It could be a little quiz or email that gets shot into professor's mailbox with intros of all the people that they don’t know and compiled into one single video. Additionally they suggested a consolidated class video that would put all the videos together to be viewed in one click. This would be useful if the professor did not feel like clicking on each student on the first day of class. They can just watch a “single” intro video that has all the students saying hi to them. One participant suggested a feature of updating student photos. For example they can take photos of students in the first class and update student profile photos in the roster. 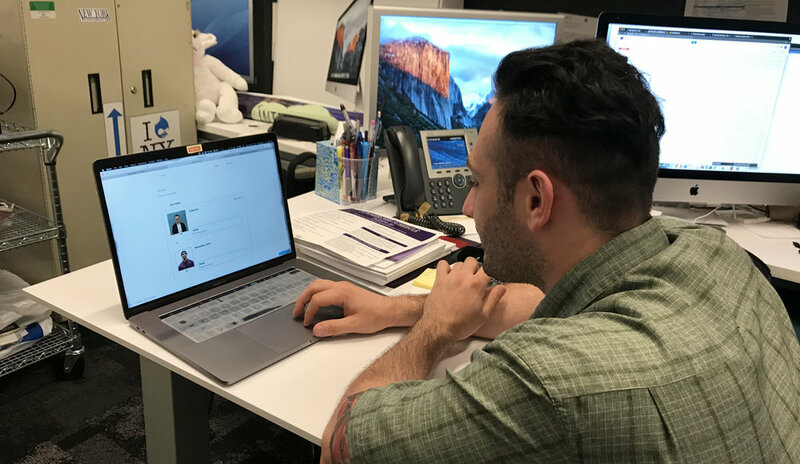 Since the photos in the roster often don’t match what students really look like in person, and students sometimes would change their style, or the photos for undergrad students are the ones they were took in freshman year, so it would be helpful to have an updating feature. It was really fun to talk to professors about the challenge of matching student names and faces and I learned many insights and unique stories from them. Coming up with the concept of an interactive roster and testing it with a clickable prototype with professors led me to this idea of the interactive roster and how it would be beneficial to them. Many of them told me they wished our school could have this feature in the future. The feedback also gave me additional insight and ideas for making the experience more efficient and effective. I would further iterate on the experience based on the feedback from the user. Additional I think the user testing would be more robust if it were conducted in context, during the first week of class. Thanks for giving me the opportunity to solve for this challenge. Stafford, Tom. “Future - Never Have the Embarrassment of Forgetting a Name Again.” BBC, BBC, 25 Nov. 2015, www.bbc.com/future/story/20151113-how-to-never-forget-a-name-again. Wollan, Malia. “How to Remember People's Names.” The New York Times, The New York Times, 27 Feb. 2015, www.nytimes.com/2015/03/01/magazine/how-to-remember-peoples-names.html. Popescu, Adam. “Simple Ways to Be Better at Remembering.” The New York Times, The New York Times, 19 Oct. 2017, www.nytimes.com/2017/10/19/smarter-living/simple-ways-to-be-better-at-remembering.html.